Daryl Johnston is a former American fullback who played in the National Football League (NFL). He played professional football for 11 years for the Dallas Cowboys. Furthermore, he was named the General Manager of the San Antonio commanders in 2018. Currently, he also works as an NFL analyst. As an analyst, Johnston reportedly earns around $65,500 dollars as his yearly salary from Fox Sports. Further, he has an estimated net worth of over $3 million. As of 2019, Johnston has an estimated net worth of over $3 million. Further, he has an average salary of $65,500 dollars annually, as an analyst for Fox Sports. Besides, he is also the general manager of San Antonio Commanders through which he reportedly earns $50,000 per annum. Moreover, Johnston's earnings during his playing career are assumed to be about $2 million. He also owns a home in Dallas, Texas, where he currently resides with his wife and two children. Other than being a former NFL player, Johnston is pretty famous in social media. He has 191k Twitter followers. Daryl Johnston is married to his wife, Diane Krebs. They exchanged wedding vows on March 30, 1996, after dating for a year. Together, they have two children; a son named Aidan and a daughter named Evan. There isn't any further information regarding his family life. Diane was a local model and the couple first met in December 1994. They started dating each other in January 1995 after their first date on January 6. Currently, Daryl Johnston resides in Dallas, Texas along with his family. His relationship with his wife is going on strong as ever. Daryl Peter "Moose" Johnston was born on February 10, 1966, in Youngstown, New York to parents, Peter Johnston and Ann Johnston. As per his nationality, he is American and belongs to the White ethnic group. Further, his star sign is Aquarius. Daryl Peter "Moose" Johnston attended Lewiston-Porter High School in Youngstown, New York where he played for his high school football team. After completing high school, Daryl Peter "Moose" Johnston enrolled at Syracuse University and played for the University team. Daryl Johnston was selected by the Dallas Cowboys in the second round (39th overall) of the 1989 NFL Draft. He played in 149 consecutive games from 1989-1997and scored 22 career touchdowns and had more receptions than carries. Due mainly to Johnston's contributions, the NFL created the fullback position in the Pro Bowl and prior to this change, blocking fullbacks had little chance of beating out traditional running backs, who had better statistics. 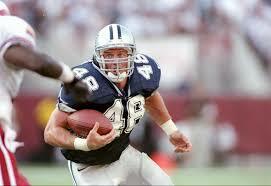 In 1993, he became the first fullback ever selected for the Pro Bowl, earning trips in 1993 and in 1994. Johnston retired at the end of the 1999 season, after suffering a neck injury and joined the program Players Inc Radio in 2003. He also worked as a color commentator alongside Kenny Albert. He further worked with Tony "Goose" Siragusa and was an analyst for the NFL Network's "Total Access" until 2012. In 2017, he continues his broadcasting career with NFL on FOX, teamed with Chris Myers and Laura Okmin. Daryl Peter "Moose" Johnston was not only a world-class athlete but also has a very attractive individual. The famous NFL star is 6 feet 2 inches in height and weighs around 110 kg.